New ListingAntique Pumpkin Trinket Snuff Box Betel Squash Possible Bass w/ Silver-Plate? 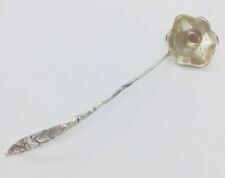 Antique Sanborns Sterling Silver Squash Blossom Serving Fork Mexico RRR 11"
TIFFANY sterling silver ~ LOBED DISH BOWL ACORN SQUASH HANDLES ~ OUTSTANDING!! Lap Over Acid Etched by Tiffany Sterling Place Soup Spoon w/Squash 7"
Asheville Tileworks and Pottery Round Dinner Plate Orange Squash Gourds 12"
Antique Victorian Large Solid Silver Chalice By Lambert Co Communion Church 8"
This page was last updated: 22-Apr 19:57. Number of bids and bid amounts may be slightly out of date. See each listing for international shipping options and costs.